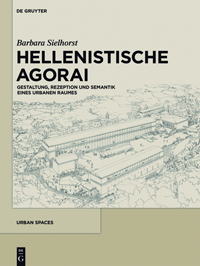 Shear's hefty tome offers an architectural study of public building in Athens and Attika from the 450s-420s B.C. The Preface explains that ideas in this volume date back to his doctoral dissertation, completed at Princeton University in the mid-1960s, and have been shaped and refined by seminars with his graduate students. The author's stated goal is "to reconstruct an overarching program to aggrandize the cults and festivals of Athens" as a result of Greek victory in the Persian Wars (xvii, cf. 229). As the author explains in the Introduction (Chapter 1), it's his contention that the buildings exhibit details that point to the same group of workmen engaged on all. Eleven chapters (including the Introduction) treat the "Periklean Program" of architecture with discussion of historical and religious circumstances as they impact construction; some chapters discuss context more than others but the focus is squarely on architectural design and construction. Endnotes, an Epigraphical Appendix, a Chronological Table, Bibliography, Subject Index, and Index Locorum complete the book. While the text has footnotes, the Endnotes serve as an appendix with extended discussions of various matters. Chapter 2, The Development of the Periklean Program, looks at evidence (primarily epigraphic and literary) for building in connection to the Persian War victory, e.g., the paintings in the Stoa Poikile, the Bronze Athena on the Akropolis, the Athena Nike sanctuary. 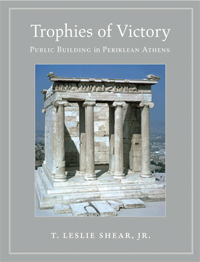 Although I share the author's enthusiasm for the extraordinary building activity and its even more remarkable quality, the existence of such a 'program' - especially one so extensive as that imagined here, which treats not only the buildings of the fifth-century Akropolis (where one really can speak of a 'program'), but also the other structures in Athens and temples in Attika - is problematic. There are numerous questionable or illogical statements. Shear makes it sound as if the wall painters themselves decided to use myths to express real events, but there is no evidence for this and common sense suggests otherwise (16). He writes that after the battle of Salamis "[...] it was a moment when all Greeks could exult in the final repulse of Xerxes' armies [...]" (7). The Greeks could not know this was the final battle, and their subsequent organization of the Delian League clearly indicates, in fact, that they did not. One also wonders how reuse of the damaged material from Akropolis buildings in the reconstructed wall "plainly implies the continued ruinous condition of the buildings themselves" (17). Chapter 3, The Builders of the Parthenon, treats the logistical aspects of construction of the building, its decoration, and its cult statue: finances as known from building accounts, personnel, marble quarrying, etc. Shear argues against the common view, founded on the ancient literary sources, that Pheidias oversaw and administered the works on the Akropolis. Instead, building matters were in the hands of a committee, epistatai, elected annually, as indicated by epigraphic evidence. The very detailed treatment of the building accounts will be beyond the capacity of the average reader, but it is very useful to have all of this information gathered together and discussed here. Chapter 4 addresses what Shear clearly sees as the centerpiece of the Periklean program, the Parthenon. The chapter provides meticulous descriptions of every element of this building, together with measurements, all of which has been stated before elsewhere. According to the author, the sculptures on the building express "Periklean themes." Shear finds other scholars' interpretation of the central south metopes as the punishment of Ixion convincing but does not observe how singular the interpolation of a different subject into the Centauromachy of the metopes would be, nor does he explain how a viewer might make the link between the two stories. The most surprising idea in this chapter comes on its last page: that the small wooden cult statue of Athena Polias that received the peplos in the Panathenaia originally stood next to the Athena Parthenos statue in the Parthenon, an idea first published by Furtwängler in 1895; Shear presents his argument for this idea in Chapter 11. The Hephaisteion is treated in Chapter 5, which begins with a declaration that the temple was strongly influenced by the Parthenon. That may be true but the construction of the Hephaisteion was begun before that of the Parthenon, and it does not seem to have occurred to the author that the former may have inspired the latter. Chapter 6 is devoted to the Telesterion at Eleusis. Shear examines and accepts the hypothesis made by others scholars that the design of the building derives from the Apadana of Darius I at Susa and was transmitted to the mainland via Ionian Greek masons, who worked at Pasargadae. The Odeion on the south slope of the Athenian Akropolis forms the subject of Chapter 7. There is a lengthy digression on the date of the poet Phrynis' Panathenaic victory in an effort to shed light on the date of the introduction of musical agones and the building (212-214), but the date of Phrynis' triumph is, in fact, irrelevant to the latter two matters since the musical agones could have existed earlier, and there is no necessity for an Odeion in which to hold musical events (which the author himself acknowledges on page 224). By contrast, the long digression about Pausanias' and Plutarch's observations that the Odeion recalled the text of Xerxes (215-228) comes to a thoughtful and interesting conclusion. Chapter 8 takes up temples in the Attic countryside, which Shear believes were part of the posited Periklean program. His interpretation of Kaineus in the Gigantomachy on the Sounion Poseidon temple frieze as an analogy for the Persian king is unconvincing. The Propylaia is the subject of Chapter 9, while two Ionic temples, that on the Ilissos and the Athena Nike temple on the Athenian Akropolis are treated in Chapter 10. Chapter 11 on the Periklean Legacy offers a summary and conclusion, where Shear claims discusses, among other things, the cult statue of Athena Polias and the Erechtheion. Three major problems plague this publication: its origin as a dissertation, audience, and lack of updated bibliography. The book is baggy, repetitive, and needs editing. It reads like a PhD dissertation in many places, where information is added and discussed for the sake of displaying the knowledge without its being directly relevant to the topic. A good example of this is the aforementioned discussion of Phrynis' victory in Chapter 7. Here is where a firm editorial hand and detachment would have been helpful; this is the kind of detail that belongs in a lengthy footnote or can be omitted altogether and is exactly the kind of information one would find in the text of a doctoral dissertation. Organization is often problematic, e.g., the discussion of the Ephialtic reforms in Chapter 2, and one senses the seams between the original dissertation and addenda to it, i.e., a lack of integration and coherence. This leads to the next problem. For whom is this book written? The book reviews material already familiar to most scholars of this topic, yet it is too advanced for students who are beginners to the field. There is no description of what the Carrey drawings are other than their date. The language is technical and the descriptions highly detailed. With supplementation in the classroom or from other materials, advanced undergraduates and graduate students might profit most from this collection of material. Shear rarely engages directly with controversies and instead, simply states his view, often in the indicative mood, e.g., the H-architecture stood atop the Dörpfeld foundations (79), which is a hotly contested topic; the west metopes of the Parthenon "plainly refer to the famous paintings of Mikon" (118) of which nothing whatsoever remains save for Pausanias' description. That the Parthenon frieze depicts the Panathenaia is stated as fact, and notwithstanding the numerous citations in this section, a great deal of controversy and bibliography (as well as argumentation) has been omitted. Finally, the lack of updated Bibliography is truly surprising. Only a few entries in the 24-page bibliography postdate 2000. Shear describes Castriota's 1992 interpretation of the north metopes as "recent" (111-112; cf. 132), and the author still relies on Brommer's Vasenlisten, 3rd edition (1973) for his statistics about vases. One looks in vain for any of the volumes from the series, Topografia di Atene: sviluppo urbano e monumenti dalle origini al III secolo d. C.; Leventis' 2014 monograph concerning many of the structures discussed in this book ; Cruciani's 1998 study on the Hephaisteion and the Stoa Poikile ; or any of the many publications by Tanoulas after 1992 on the Propylaia. There is no mention of Palagia's recent challenge to the claim that the Athena was funded by spoils from Marathon ; McInerney's view of the Hephaisteion's east frieze ; Barringer's work on the Hephaisteion ; Pope and Schultz on the Parthenon doors ; Lippman, Schultz, and Scahill on the Nike Temple ; Scholl on the Caryatid porch of the Erechtheion ; or Shapiro on Amphitrite, Poseidon, and Bacchylides. One could go on and on. Whether the author disagrees with these authors or not, their work needs to be considered. More and better quality illustrations would have improved the book; there is little point in discussing fine details of sculpture and identifications if none of the sculpture is illustrated. And one really needs an elevation drawing to follow the discussion on pages 200-202. In spite of the shortcomings, the book is useful for scholars in pulling together a great deal of information (up to a fixed date), which is especially useful for class preparation and as a starting point for advanced research into fifth-century Attic architecture. Iphigeneia Leventi: Πόλη σε κρίση, Athens 2014. Claudia Cruciani: I modelli del moderato: la Stoà Poikile e l'Hephaisteion di Atene nel programma edilizio cimoniano, Naples 1998. Olga Palagia: Not from the Spoils of Marathon: Pheidias' Bronze Athena on the Acropolis, in: Marathon: The Day After, edited by Kostas Buraselis / Elias Koulakiotis, Delphi 2013, 117-137. Jeremy McInerney: Pelasgians and Leleges: Using the Past to Understand the Present, in: Valuing the Past in the Greco-Roman World, edited by James Ker / Christoph Pieper, Leiden 2014, 25-55. Judith Barringer: Making Heroes in the Athenian Agora: A New Interpretation of the Hephaisteion, in: Structure, Image, Ornament: Architectural Sculpture of the Greek World, edited by Peter Schultz / Ralf von den Hoff, Oxford 2009, 105-120; eadem: Art, Myth, and Ritual in Classical Greece, Cambridge 2008. Spencer Pope / Peter Schultz: The Chryselephantine Doors of the Parthenon, in: AJA 118 (2014), 19-31. Mike Lippman / Peter Schultz / David Scahill: Knights 843-59, the Nike Temple Bastion, and Cleon's Shields from Pylos, in: AJA 110 (2006), 551-563. Andreas Scholl: Choephoroi. Zur Deutung der Korenhalle des Erechtheion, in: JdI 110 (1995), 179-212. Harvey Alan Shapiro: Myth into Art: Poet and Painter in Classical Greece, London 2002.